First I installed Joomla localy via XAMPP, then installed T3 Framework via extension manager, then installed Purity3 via extension manager. Then I created few sample articles with random words inside to work with. Then I changed site layout and menu layout to blog. This should be enough but sadly it looks nothing like the demo. My articles aren't expendable but spread whole page long one above another. I don't have right sidebar Blog Tags, Chronology nor Categories. I don't even have page changer below articles that spread new articles between multiple pages (pushing old ones firther). Basically instead of demo clone I have one big nothing. In the end what I need is to make sample blog fast and easy. That's why I installed Joomla and Purity3 in first place. Good guide (self made or link to one) would be appreciated. Rather than manually installing Joomla, then the T3 framework and then the template, I would strongly suggest you use the Quick Start package which contains everything in 1 bundle. When installing it asks you if you would like to install any sample data, there should be a custom option that will set up all articles and extensions that you see on the demo site. You should download and install the quickstart package. It's a zip-file containing an exact copy of the demo site, including both Joomla, the Purity III template and any extension used in the demo. 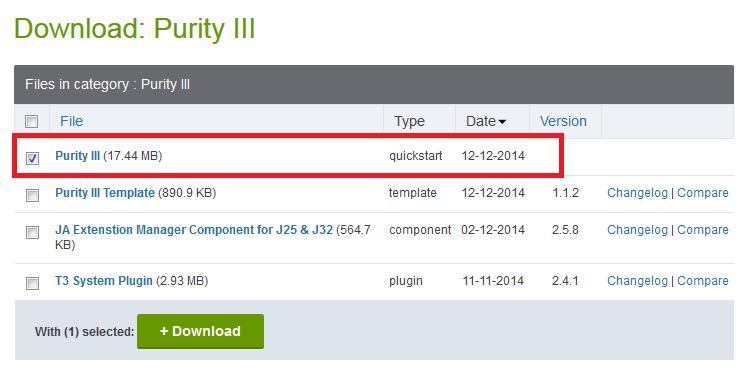 Note that this is not to be installed from the Joomla extension manager. You install it like you install Joomla (unzip to a subfolder of your your XAMPP htdocs folder, visit http://localhost/yoursubfolder and follow the instructions. More details can be found at the Purity III documentation site. Once installed, you can either build your site using the demo, or use the demo as reference for your own site to see exactly how each part is set up. How do I remove the install “Sample Data” dialogue box and permanently disable this option?